Pamela Bielak is on a crafty mission: The president of Toronto non-profit Crafting for a Cure (CFC) provides craft kits, toys and other fun, creative distractions to sick children and teenagers in hospitals across North America. Inside her purse is one of the tens of thousands of small kits that she will ship to hospitals this year from her home. The kit she holds up is a plastic bag filled with a glue-stick, crayons, stickers and other art supplies. 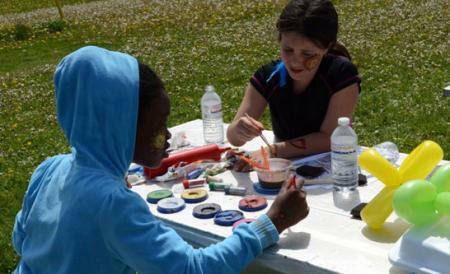 “Crafting is really therapeutic for all ages and all sexes,” Bielak tells Samaritanmag. CFC already supplies 41 hospitals in Canada, 26 in the United States and three in Israel. That feat is even more extraordinary when one considers that Bielak registered the charity just three years ago. The idea stemmed from challenging hospital visits with her own family. Bielak’s twin children, 13-year-olds Daniel and Naiomi, spent long periods in SickKids Hospital in Toronto as Daniel suffered from severe asthma. Naiomi loved doing crafts on these visits, but there was not much else to entertain her. When she began CFC, Bielak initiated a program to ensure that there was a lively space for sick kids that could help them forget the dull hospital setting. She used funds donated to the charity to renovate the Lung Playroom at SickKids Hospital in Toronto. The room opened in October 2010. Bielak has three storage units filled with products that will head to hospitals throughout the year, but she says it is not enough. She’d like to renovate more playrooms. Bielak often travels to hospitals with her co-op student volunteers, stacked with bagfuls of beads and other materials to craft with the patients. However, she also visits the hospital often to treat her own illness, Still’s, a rare autoimmune disease, which also impacts how much she can get done for CFC. 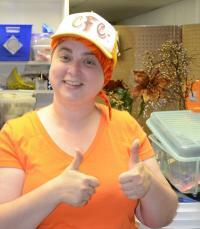 Bielak and her CFC volunteers also promote school-and-community-wide programs, such as Kilometres for Kids (or K4K). 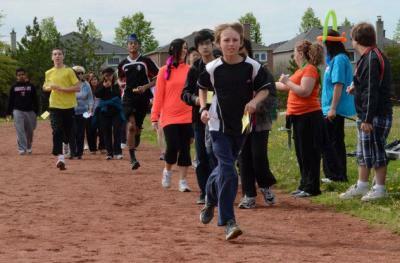 K4K is a mini-marathon fundraiser held at schools where students raise money through sponsorships and run laps to show their benevolent spirit. Half of the money raised would go to the host school and the rest to a hospital, although the school has the option to donate more than 50 per cent of their total to the hospitals. Another school-held fundraiser, entitled Crafting for Kids, has the same donation strategy as K4K. Older grades make craft kits while younger students design artwork for the sick children to receive in the hospitals. As with K4K, this fundraising program also raises awareness about asthma and the importance of breathing. Bielak recently launched the charity’s online store, which consists of pre-made and handcrafted products donated by companies and designers. Many companies are not allowed to send money to the charity, but can give product to sell for funds. One of the charity’s biggest sponsors is Starbucks, which helped to organize a recent community-wide K4K run. “[Starbucks] benefitted all the proceeds but for every dollar a Starbucks employee raised, corporate matched it,” Bielak says. The 120 participants raised around $13,000 for CFC during the run. Bielak is also in talks with the coffee company to expand K4K to become a citywide – and potentially cross-Canada – fundraiser. In the near future, Bielak has plans to establish craft stations with five hospitals and ten neonatal intensive care (or NIC) units across the country. This summer, the 15 facilities — at least one in each province in Canada – should receive about $50,000 worth of crafts and other products. Most of all, Bielak says that the response she gets from the sick children, their parents and the nurses and child youth workers at the hospitals she visits makes all of the hard work pay off. Recently, a nurse from Sudbury Hospital called Bielak asking how much she owed her for the toys and craft kits. Bielak explained that the materials were free and the only thing she wanted was a thank you.